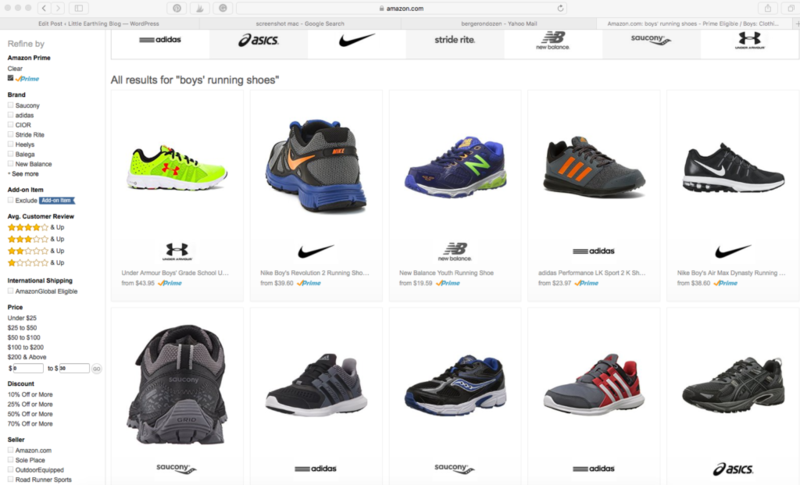 This how to save money on kids’ clothes post contains affiliate links. I shot a birth this weekend. I took my girls shopping for new pants. When my kids were babies and toddlers it was easy to find them cute, quality clothing at affordable prices. I shopped garage sales in the summer and consignment stores all year round. I checked out sales at our favorite stores. It was easy and fun. When you have a three-month-old baby, anything bigger than their current size will eventually fit. Not only that but consignment stores are filled with baby and toddler clothes. When Adalia and Judah were five and six I made a horrible discovery, it was no longer easy to find used quality clothing. It’s not that I couldn’t find it…it’s just it was no longer easy or a given. That meant I needed to find new strategies for saving money on kids clothes. 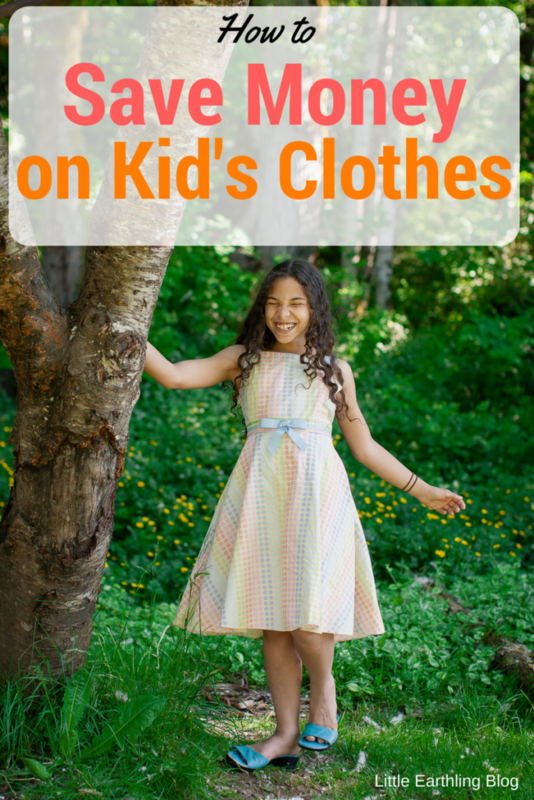 Here are my best tips on how to save money on kids’ clothes. I still love to shop at consignment stores, it’s just that I can no longer go there and be guaranteed that I will find what I need. Becuase of this I have come up with other great strategies for saving money on kids’ clothes. One thing I do is know my stores and know my prices. Old Navy has kids’ jeans go on sale for $10 every few months. Because I know this, I try to wait until they are on sale, and stock up then. This is so much easier for the boys. I know exactly what size they wear (and what their next size will be) so it is easy. Now that my girls are all getting figures, this is harder and I actually have to take them to try to the clothes on. Because we were in a pinch, I had to pay $14 per pair yesterday for Old Navy jeans, instead of $10. Not terrible, but not as good as it could have been. When Adalia was a year old, I was thrilled to find outfits on sale at a local discount store. Shirts and pants sets for $5! I bought five and proudly brought them home to show Chuck. For $25 I had just updated Adalia’s entire wardrobe. Chuck was just as happy as I was…until she wore them and I washed them. The outfits pilled after one washing, faded within weeks and the seams were coming loose. Turns out those five dollar outfits were worth about five bucks. Lesson learned. Not long after, I started shopping through Land’s End catalogs. They sold the play dresses and tights we loved as well as quality Squall Jackets. After our first order, we started shopping their overstock section. We would buy coats and clothing at heavily discounted prices and store them away until they fit. I remember talking to a friend who said she couldn’t afford their “expensive coats” so bought a $25 jacket for her daughter at a discount store. Chuck and I had just paid $39.50 for a Land’s End squall jacket that went on to be worn by five kids…then passed along to friends. This year I bought Avi two swimsuits from Land’s End for $10 each! 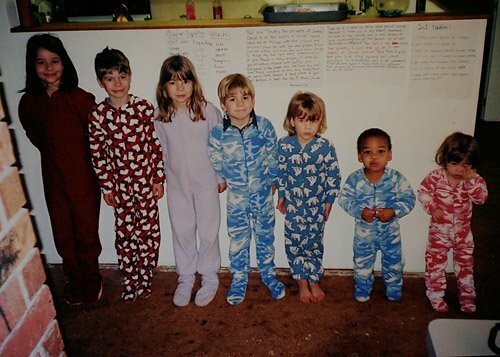 For years we bought each child one pair of Lands End fleece pajamas. They were expensive but lasted year after year. Many of these went through six kids before they wore out. Our kids have fond memories of the day they got to pick out their new winter pair. See the polar bear pajamas Kalina is wearing? Those were originally Judah’s…it wasn’t until child number four wearing them that we needed to cut off the feet…and they still got several years of wear after that. My current favorite clothing company is Primary. Primary sells clothing in a huge variety of colors that are perfect for mixing and matching. Primary clothing has no logos, no words, no pictures. They are simple, classic, kids’ clothing. You can read my full review of Primary clothing here. One key to knowing how to save money on kids’ clothes is to know when to spend more and when to go the cheaper route. Undershirts and underwear? As much as I love this adorable underwear, I’m not spending $10 a pair on my kids. Same for undershirts and cotton pajamas for the summer. (We heat with a woodstove, so we do invest in expensive pajamas for the winter). I have personally found brand name socks last longer than generic. This basically refers to the know your stores and know your prices. Don’t get stuck having to buy three girls new jeans all at once! When you are in a pinch, you sometimes have to spend more money. I don’t mean skipping school clothes shopping altogether, I have found great deals on the basics (socks and underwear) at back to school sales. What I mean is don’t feel obligated to buy your children all new wardrobes or even a new outfit just because they are going back to school. I find it more economical to shop as each child outgrows things and spreading it out like this is easier on our budget. I buy everything from Pull-Ups to my favorite organizing bins on Amazon. One thing that didn’t occur to me until recently was to buy shoes on Amazon. Earlier this year I had to buy three of the kids new shoes and ouch was it expensive. Then in the price box, I typed $0-$30. Here is where it takes a bit of sleuthing. 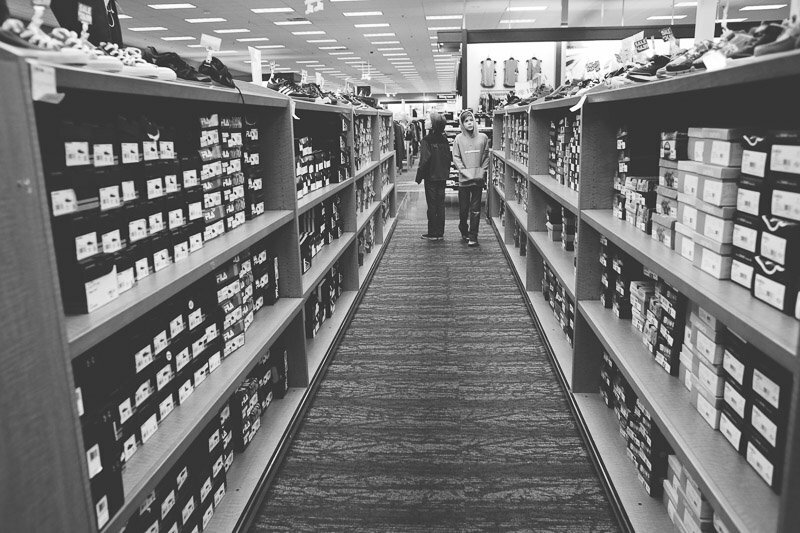 The shoes are often different prices depending on the color. I clicked on color after color until I found ones that were in my price range and let the kids pick from there. For Jubilee and Hezekiah’s PE shoes (that are only going to be worn a couple of hours a per week) I just bought the shoes without consulting them. This isn’t a fashion statement, they are PE shoes. When Tucker needed new shoes recently I did the same thing. I ended up spending $38 on Keen shoes that were on sale (the same shoe in a different color is selling for $51.99 right now and in pink for only $27!). Since I know my stores and know my prices, I knew this was a good deal and that boy is active and hard on his shoes. 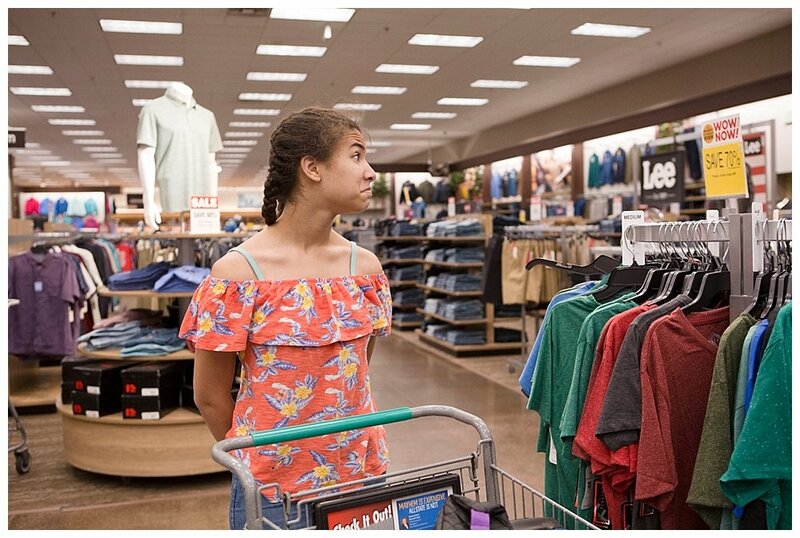 What are your tips for saving money on kids’ clothes? I’d love to hear them. And if you are worried about stockpiling clothes, read my post Six Steps to Managing Kids’ Clothes. Thanks for the tips! I learned the quality lesson last year. I bought cheap plastic walmart boots for $25 (CDN). But each of my children went through two pairs! This year, I invested in a more expensive pair for $40 from somewhere else. They are holding up so much better and I am confident that I will only need one pair per child. I also try to shop the consignment stores, but only for pjs and t-shirts. I have refused to buy second hand pants since they have always torn holes in the knees. So, I buy new pairs of pants and hope that they last through all three of my boys. 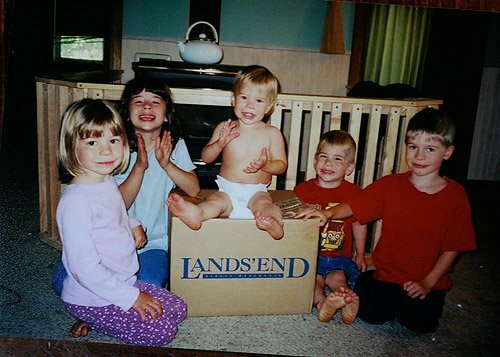 We used to buy rubber boots from Lands End or LLBean when our kids were younger. $35 on boots, but they lasted until they were outgrown and could be worn by another child or two (or three). That makes perfect sense about buying new pants and used shirts! Thanks for the tip. We are absolutely loving targets new cat and jack brand. They prices are only a $1-2 more than our local high quality resale store, they have frequent sales and coupons and they have a one year garentee – wear out the reinforced knees they will replace them. (You do still have to have the receipt). We also have a resale franchise here called kid to kid and they only accept cloths without holes and stains. They are a little more expensive but I’ve been able to find converse shoes for $10 instead of $35-40 new etc. pretty much everything is high quality name brand and if we use it lightly I can take it back and they will buy them back from me! I too shop at a slightly more expensive consignment store because the clothing is better quality. I never go to Target becasue the only one around here is in our local mall. Not only do I despise going to the mall, but it makes parking more difficult. Glad to hear about the Cat and Jack. I hear you on that, and it may be better for your family to not buy expensive boots. For a long time, a certain child of mine was so careless he only got cheap shoes, boots, and coats. I know it sounds kind of mean, but would consistently lose his items, so we held the nicer ones back for his younger siblings. Shirts and pants at thrift stores. Except that I sometimes have to buy pants new for my 5 year old boy because thrift stores rarely have boys’ pants without holes. And I have had to make lined pants for my middle child because she’s super skinny and gets cold easily…do you know of anyone who sells lined super skinny waist pants in toddler/little kid sizes? Winter boots on Amazon. We live in a very cold area, so I don’t skimp on outerwear–everyone is miserable if one kid is cold outside. 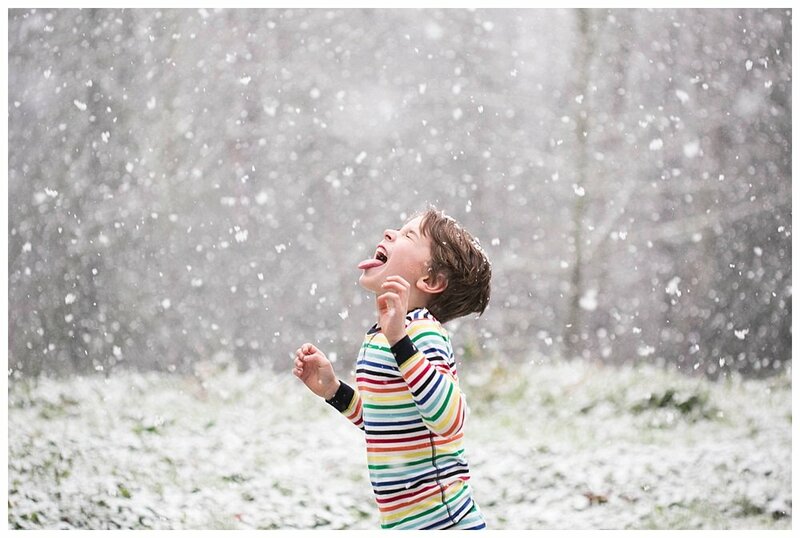 Winter outerwear on clearance from Patagonia and Land’s End (Patagonia is more expensive, but I find it warmer than Land’s End…and again, it lasts through all of our kids and more!). Bathing suits on clearance from Land’s End when they’re on clearance. Underwear and socks usually on Amazon–usually Hanes cotton socks and underwear because I know that their quality is good and they treat their workers well. Winter socks on Amazon. I spend more on these because they’re like winter outerwear–they last longer and cold feet make everyone miserable. I let the kids choose style and color if the pricing and quality are similar, otherwise I choose. Oh yeah, and shoes on Amazon, unless I can find decent ones at a thrift store. Rainboots I usually get used. They don’t last long, but they’re super cheap and easy to find at thrift stores around here. Such an imformative article! Thank you very much for sharing!